Discussion in 'Science & Technology' started by beefrave, Dec 13, 2011. 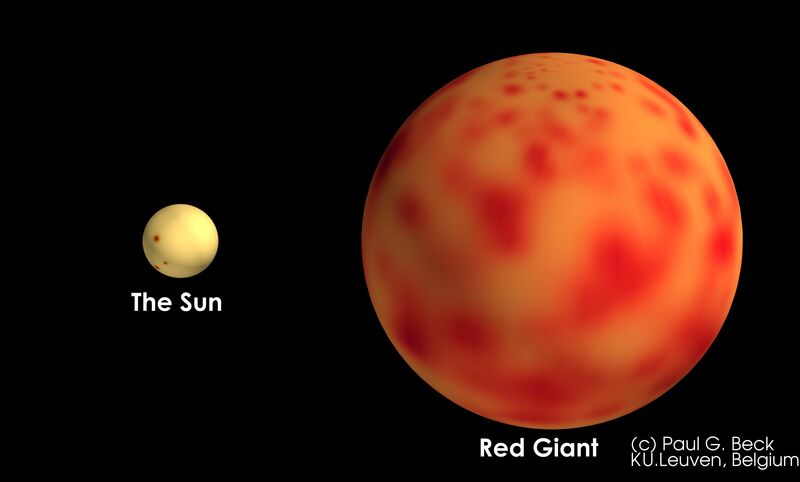 Comparison of diameter and rotation rate of a redgiant to the sun. Scientists have made a new discovery about how old stars called ‘red giants’ rotate, giving an insight into what our sun will look like in five billion years. An international team of astronomers led by PhD student Paul Beck from Leuven University in Belgium have managed to look deep inside some old stars and discovered that their cores spin at least ten times as fast as their surfaces. The result appeared today in the journal Nature. It has been known for a long time that the surfaces of these stars spin slowly, taking about a whole year to complete one rotation. The team has now discovered that the cores at the heart of the stars spin much faster with about one rotation per month. The discovery was made possible because of the ultra high precision of the data from NASA’s Kepler space telescope. This artist impression illustrates the rotation inside a red giant star. Such stars have radii of more than 5 times the radius of the Sun. Initially the outer layers, which are rotating very slowly, are shown. When these layers are hidden, the hot core of the star, which rotates 10 times faster than the surface, becomes visible. While the surface of this red giant needs about one year to complete a full revolution, it takes the core only a few weeks to rotate once. For better visual effect, the rotation rate is artificially increased. In the animation, 60 seconds correspond to an entire year in real time. The Kepler space telescope, is one of NASA’s most successful current space missions. Designed to search for Earth-size planets in the habitable zone of distant stars, the mission has detected numerous planetary candidates, and has confirmed many bona fide planets outside our solar system. Kepler is capable of detecting variations in a star’s brightness of only a few parts in a million, and its measurements are therefore ideally suited to detect the tiny waves mentioned above. The effect of rotation on these waves is so small, that its discovery needed two years of almost continuous data gathering by the Kepler satellite. Did we really need a space mission to tell us this? Things spin faster at their core is basic physics.